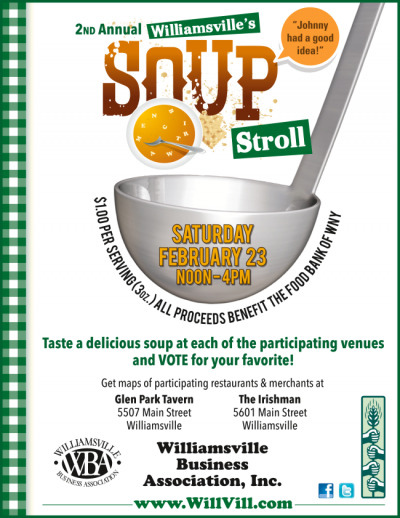 Don't miss the 2nd annual Williamsville Soup Stroll on Saturday, February 23rd, from noon to 4:00pm. Presented by the Williamsville Business Association, soup will be served up at $1 per serving and all proceeds go to The Food Bank of WNY. Come taste a delicious soup at each of the participating restaurants and VOTE for your favorite! The winner of will receive the coveted Soup Stroll Trophy, in dedication to John Cansdale, the mastermind of the event. Visit www.willvill.com for more information and stop in to the Glen Park Tavern or The Irishman for the map of all participating restaurants.